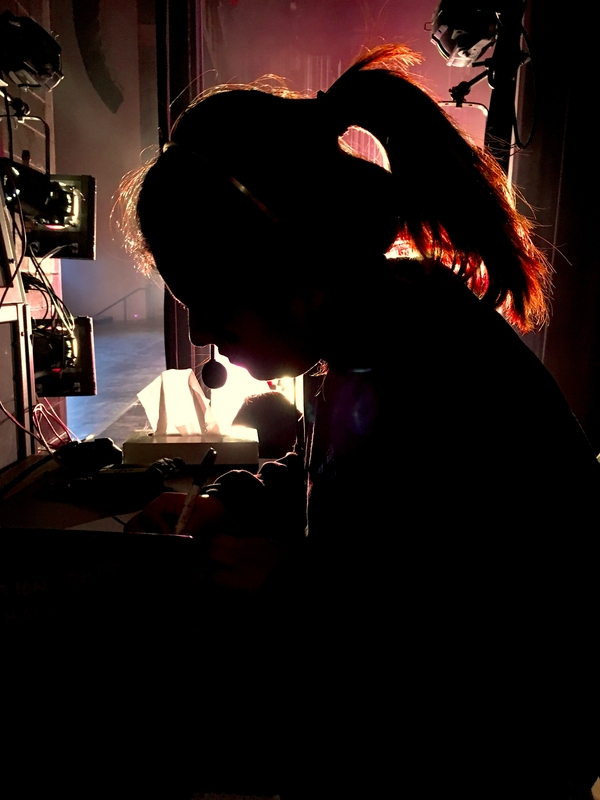 Stage Manager Demmi Delgado runs the Halloween Show from behind the scenes. Image by Inaki Herrera. What happens off stage in the Tony Bennett Concert Hall at the Frank Sinatra School of the Arts (FSSA) is as impressive as the actual performances on stage. Those who watch the well choreographed routines on stage see nothing of what lies underneath the dim fluorescent lights of the stagecraft tables backstage. For senior art major Demmi Delgado, it was especially frightening to be a part of this year’s Halloween show, because every moment, every movement and every breath was meticulously crafted and commanded by her stagecrew. And Demmi being the stage manager for the Halloween show meant that behind her was a well coordinated team that commanded the projectors, worked with sound, and helped keep the show under control. Stagecraft is in essence a studio of its own at FSSA. Every day during sixth period the stage crew members meetup to learn the knowledge of set designs, lighting and learning how to use the monstrous motherboard placed near the back of the auditorium. Stagecraft is and always has been a well orchestrated machine. During every school function and production this crew works together in order to make shows such as Aida and Rent happen. If it weren’t for stagecraft, scenes from Rent would have never existed; the lighting for the Major Works Production would go dim; and the scenery for the upcoming Tony Bennett Birthday Concert would fall and crumble. Yet, knowing the amount of work that has been put into these shows, their craft behind the stage sometimes goes unnoticed, or perhaps it’s just a preconceived notion. Flor Ramírez a member of the stagecraft says it best. “We do get recognized, but not everyone knows who we are,” she said. Chloe LaBorde, a senior drama major, said she appreciates the work that stagecraft does. “I think they deserve way more recognition because honestly when we have blackouts and you see how they just pull everything together,” she said. However, when stagecraft is in its element, being recognized doesn’t really matter because the production at hand becomes the most important piece. In terms of the Halloween Show, Demmi could be seen reviewing the order of the show, making sure that everything was right and without a hitch. Even at the start of the show when the projectors weren’t working Demmi stayed focused and determined. She knew what her job was and what had to be done. “This entire show is my responsibility and it needs to come out perfect,” she said. It was clear that through the fear, anxiety and pressure Demmi carried the production of the show both professionally and diligently, and sometimes that is more powerful than the performances on stage.